In early February I lamented the consumption of my last can of Cherry Coke. Since then I've tried to replicate the flavour with syrups, but my experiments have been unsuccessful. 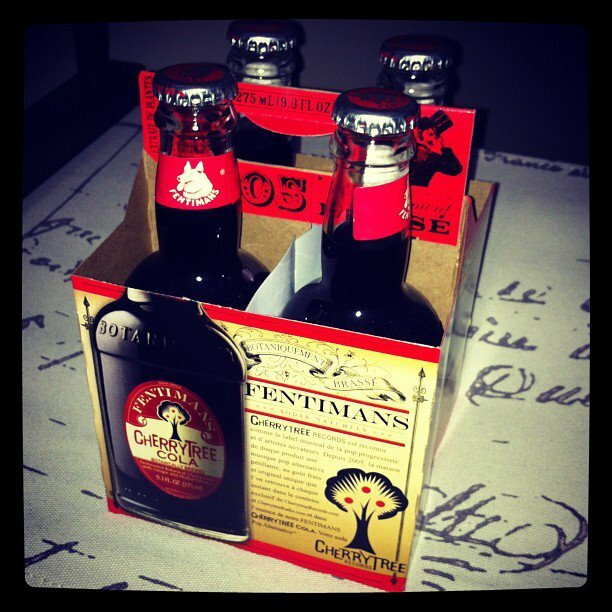 Today, however, I stumbled across Fentiman's Cherry Tree Cola at the Val-Mart in Leduc. As a cola connoisseur, I couldn't leave this beverage untried. Sold in retro-styled glass bottles and made with cane sugar, Fentiman's is surely being marketed to those of us unfortunate enough to have develop a fondness for boutique sodas. "UNFILTERED: up-end bottle to gently invigorate for naturally superior flavour," suggests the packaging in delightfully cheery turn-of-the-century (the 19th/20th centuries, that is) style. Dutifully I did so, and while I'm not sure if turning the bottle upside-down really altered the flavour, this cherry cola certainly offers a refreshing, slightly spicy bouquet. It's not as strongly cherry-flavoured as Cherry Coke, but it certainly feels more organic on my tongue - though perhaps that's a psychological artifact of the packaging and ad copy as much as the flavour. Whatever factors may have influenced my reaction. I find Fentiman's Cherry Tree Cola a spicy, satisfying brew of satisfyingly sweet but not cloying cola and cherry flavours. Three and a half cherries out of five. Next time I stop in Leduc, I'm picking up some Fentiman's. Sounds good.